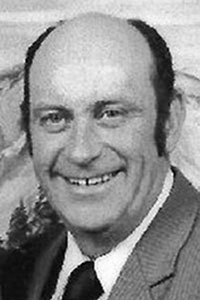 PARSONSFIELD - Henry McKeown, 85, a longtime resident of Parsonsfield, died peacefully at his home on Feb. 9, 2019. His family was by his side and knows that he is, once again, reunited with his beloved wife, Annie. Henry was born on Sept. 15, 1933 in Far Rockaway, N.Y., the son of James J. and Yvonne M. (D'Amour) McKeown. With his family, he moved to Saco and he attended local schools. Henry served proudly in the U.S. Army during the Korean War and obtained the rank of Staff Sergeant. Henry began a long and successful career at the Pepperell Mill beginning in 1971 and worked his way up through the ranks becoming the Superintendent of the weaving department for Biddeford Textile, retiring in 1999. Not only did the mill provide employment, it was where Henry would meet his future wife, Annie. While out dancing one night, Henry danced with Annie who was smitten with this tall handsome man. Annie took classes in sign language so she could have a conversation with her future mother-in-law. By this simple act of kindness, she became Henry's true love. They married on July 1, 1974 and together with a blended family, made their home in Parsonsfield. Henry and Annie were a team that worked hard together and shared their love of gardening. Henry also enjoyed being out in the woods hunting with his son, John, and taking trips to Foxwoods with his daughter, Deb and Joe. Henry and Annie had the good fortune of traveling out West to Colorado, Las Vegas and many memories were made when they flew to Hawaii to celebrate their 15th wedding anniversary. Henry was a propionate of gun safety and spent time reloading his own ammunition. He was happiest when he was outdoors and puttering around the house. Henry believed in giving back to his faith family as a Eucharistic Minister, a 4th Degree member of the Knights of Columbus, as well as serving on various committees and was a faithful parishioner of St. Matthew's. Henry was also a longtime volunteer at the Veterans Home in Scarborough. Each morning Henry and Annie would say their morning prayers, recite the rosary together and then played a fierce game of Yahtzee! They truly loved being together and their hearts and home were open to many who needed a warm meal, someone to listen without judgement and the advice given included a good dose of humor! Henry will be remembered as a strong yet gentle man; with a smile that could light up the room and a devotion to his family that comes from his generation. He was an honest and hard-working man. He will be dearly missed by his children and their families. We hope you are enjoying a hot cup of coffee and playing Yahtzee with your sweetheart Annie. Rest in peace Dad. Henry is survived by his children, John McKeown and wife, Kathleen of Biddeford, Debra Kenney and fiancé, Joseph Risbara of Old Orchard; and grandchildren, Nathan, Mariah, Camryn, Peyton McKeown, Nicholas Kenney, Heather Cloutier and Melissa Nolette Bald; Annie's children, whom he loved as his own, Janice Ingalls, Robert Ingalls of Fairbanks, Alaska and Lisa Ingalls of Springvale; and many other grandchildren, great-grandchildren, nieces and nephews. Henry was predeceased by his wife of 42 years, Anita (Annie) McKeown; his daughter, Yvonne McKeown; Michael McKeown and his brother, James McKeown Jr.; and by Debra Ingalls. Family and friends may call on Thursday, February 14, from 4-7 p.m. at the Autumn Green Funeral Home, 47 Oak Street, in Alfred. A Mass of Christian Burial will be on Friday, at 10 a.m. at St. Matthew's Catholic Church, 19 Dora Lane, in Limerick. Committal prayers and burial for both Henry and Annie will be later in the spring at Maplewood Cemetery in Parsonsfield.